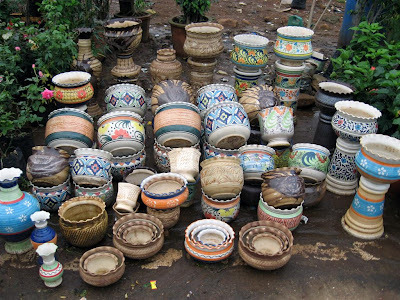 Colourful pots to pot your plants in, on sale on the road leading to Kalina, a suburb of Mumbai. The Mumbai sky at 1905 on Thursday. Pictured above are the wheels of a Ground Power Unit truck alongside the nose wheels of a Boeing 777 Long Range aircraft at the Mumbai airport. A frond is a large leaf with many divisions to it, and the term is typically used for the leaves of palms, ferns or cycads. 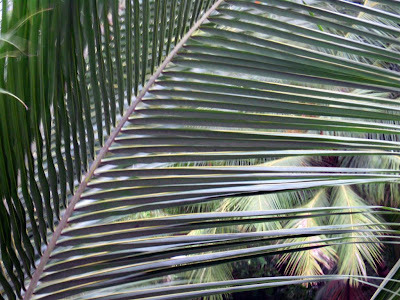 Pictured above is a frond of a coconut palm. The Coconut Palm (Cocos nucifera) is a member of the Family Arecaceae (palm family). It is the only species in the genus Cocos, and is a large palm, growing to 30 m tall, with pinnate leaves 4-6 m long, pinnae 60-90 cm long; old leaves break away cleanly leaving the trunk smooth. 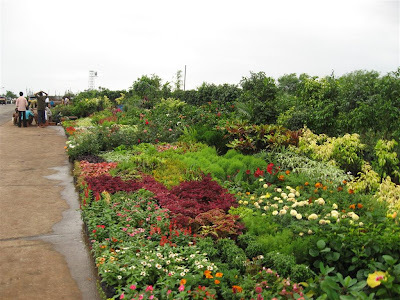 On this road to Kalina, a suburb of Mumbai, there is this hawking zone where they sell only potted plants and ferns. It is heavenly for all those pottering around. Periscope?! 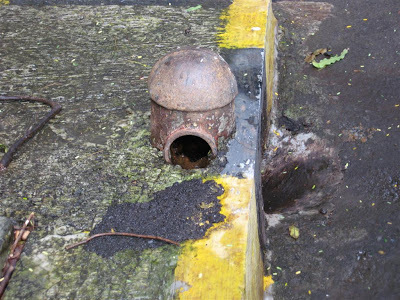 This pipe is emerging from the rooftops in Santacruz, a suburb of Mumbai! Just littered - Camera Critters! The 386-room ITC Maratha, opened in February 2001, is perceived as amongst the leading and the finest properties in Mumbai, designed in a grandiose classic style, the hotel pays tribute to Mumbai's colonial roots and the spirit of the Great Marathas. 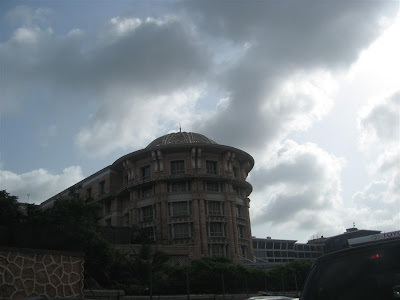 It is located at just 5minutes walk from the International airport in Sahar, Mumbai. Good Morning all SkyWatchers! 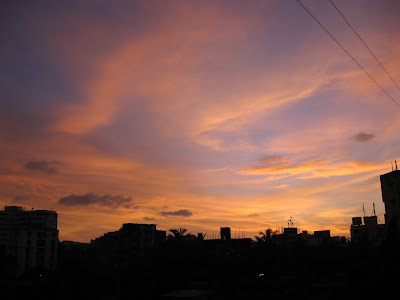 This is how the sky looks at 0644hrs this morning in Mumbai. Looks like a high humidity day with a few light showers thrown in. 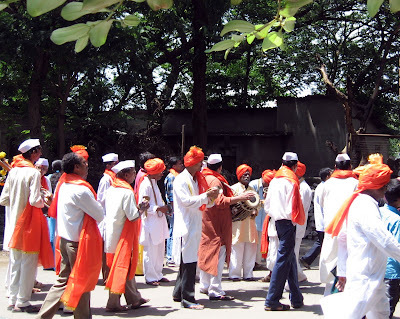 These are 'Bhajan Mandalis' or 'Hymn Groups' which perform during any religious festivals adding lot of colour and verve to the festivities. 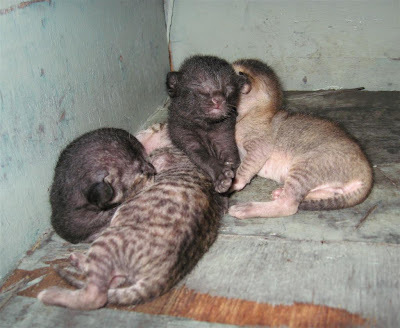 Generally they are locals who have formed groups for this purpose. They are like carol singers during Christmas. 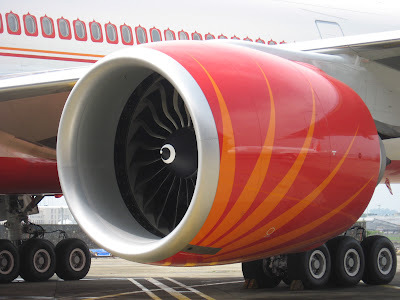 This is the engine that powers VT-ALA -'Andhra Pradesh' - Air India's Boeing 777-237/LR. Photographed at Mumbai airport. 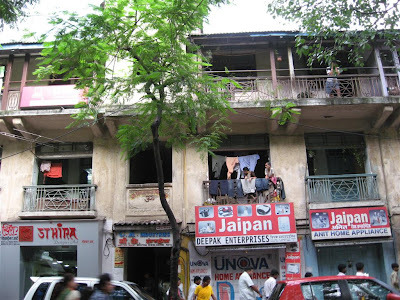 Dadar, being a predominantly middle class area, has plenty of old buildings like pictured above. The residents are in no hurry to redevelop them into skyscraping monstrosities. In case of Fire! Dig?! The world has surely grown up around the tiny fire hydrant! A Good Morning for a Scenic Sunday. 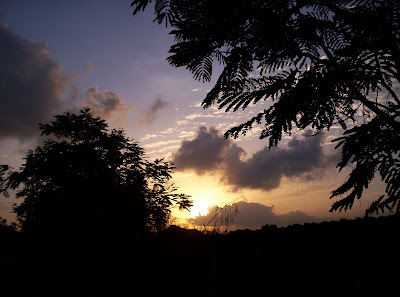 Captured this moment in the Bandra Kurla Complex with the sun rising over the mangroves. Today is Rakshabandhan day in India. It is bonding time for brothers and sisters. Raksha Bandhan is a festival celebrating the bond of affection between brothers and sisters. The day when the siblings pray for each others' well being and wish for each others' happiness and goodwill. As the name 'Raksha Bandhan' suggests, 'a bond of protection', Raksha Bandhan is a pledge from brothers to protect the sister from all harms and troubles and a prayer from the sister to protect the brother from all evil. Raksha Bandhan assumes all forms of Raksha or protection, of righteousness and destroyer of all sin. 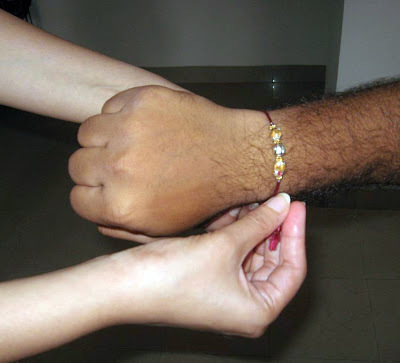 The rakhi tying ritual has become so much a part of the families that come what may brothers and sisters try to reach out to each other on this particular day bringing back the oneness of the family, binding the family together in an emotional bond. SkyWatch - Happy Independence Day! 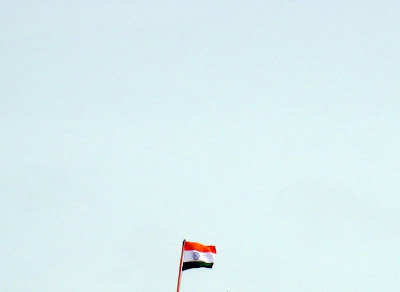 It is our 61st Independence Day today so I have posted our national flag fluttering this morning against a bright blue sky! 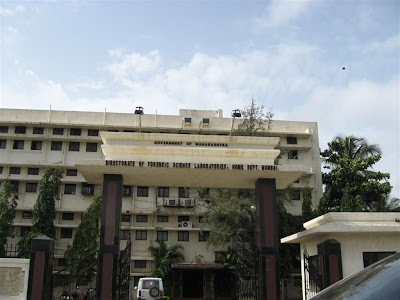 The Directorate of Forensic Science Laboratories, Home Dept., building in Santacruz (East), a suburb of Mumbai. Forensic science is primarily concerned with the application of scientific principles for the investigation of crime. Using the very latest in technology, forensic scientists convert the clues collected from a crime scene into evidence admissible in a court of law. It is the use or application of science in courts or legal proceedings. 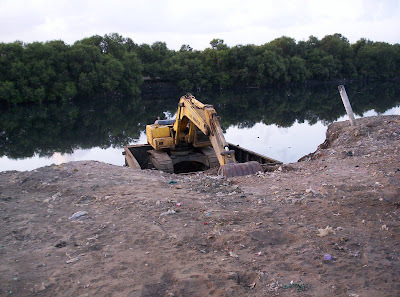 Desilting of the place where the Mithi river joins the Mahim creek to prevent flooding around Kurla and Bandra during the monsoons. Rajnigandha sold in the old flower market in Dadar. The tuberose is a night-blooming plant thought to be native to Mexico along with every other species of Polianthes. The Aztecs called it Omixochitl or bone flower. Its Indian name is "Rajnigandha". The Hindi name Rajnigandha means "night-fragrant" (rajni=night; gandha=fragrance). 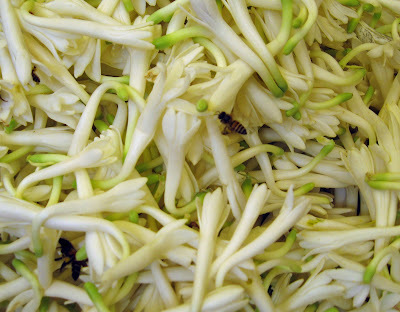 In Bangladesh it is called "Rojoni-Gondha", meaning "Scent of the Night". In parts of South India, it is known as "Sugandaraja", which translates to "king of fragrance/smell". In Singapore it is called Xinxiao which means "that on which the moth rests". In Indonesia it is called "bunga sedap malam", meaning fragrant night flower. 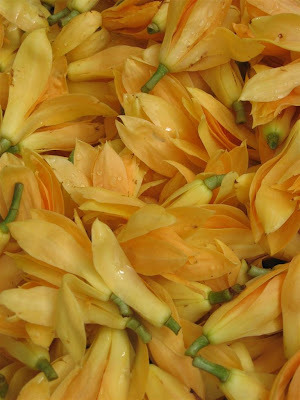 The tuberose is also used traditionally in Hawaii to create Leis and was considered a funeral flower in Victorian times. Its scent is described as a complex, exotic, sweet, floral. It grows in elongated spikes up to 45 cm (18 in) long that produce clusters of fragrant waxy white flowers that bloom from the bottom towards the top of the spike. It has long, bright green leaves clustered at the base of the plant and smaller, clasping leaves along the stem. Champa - a very fragrant flower being sold in the old flower market in Dadar. Champa is native to Indonesia, India and other neighbouring areas. It occurs naturally in the eastern Himalayan region. It is a large evergreen tree with a long straight bole of 18-21 m with a close tapering crown composed of ascending branches. The most interesting part of the tree are its flowers which are not very showy with few narrow yellowish white petals, but have an extremely heady fragrance. 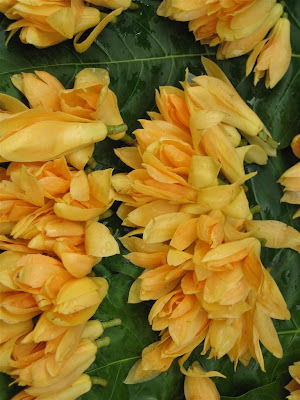 This fragrance has made Champa flowers very popular and they have been part of the culture in India from time immemorial. They are used in religious offering in various parts of India. On a warm humid night, the scents can easily be enjoyed several hundred feet away. 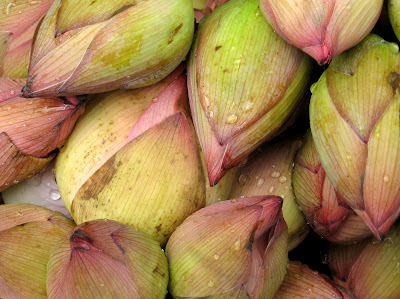 Lotus buds on sale in the old flower market in Dadar. Padma (nelumblum speciosum), the sacred lotus, is an aquatic plant that plays a central role in Indian religions such as Hinduism, Buddhism, and Jainism. The lotus and lotus flower is an ancient polyvalent symbol. The lotus flower is one of the Vajrayana Ashtamangala. It is representative of creation and cosmic renewal and shares in the chakra and mandala symbolism of the Dharmachakra. It also represents purity as its flowers grow on long stalks, which are rooted in the mud. It is also symbolic of detachment as drops of water easily slide off its petals. The lotus in both Egypt and India symbolizes the union of the four elements; earth, air, fire, and water. The roots are in the earth, it grows in and by means of water, its leaves are nourished by air, and it blooms through the power of the sun's fire. The lotus is therefore the perfection of the fourfold order of the natural world. The growth of a new flower directly from the earth-bound original (inflorescent proliferation) may be interpreted as a symbol of transcendence as found in Indian philoshophy: a spiritual emergence of a higher world directly from our physical manifestation. It may also be interpreted, as in Egypt, as the exaltation of the essence quality of the lotus. 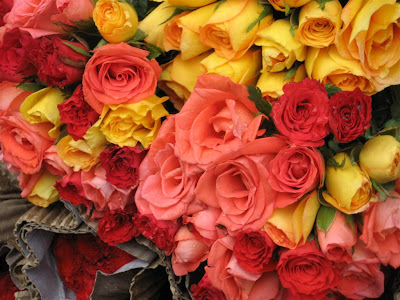 Roses roses all the way! 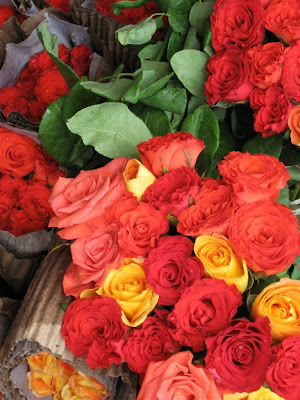 Roses on sale at the old flower market in Dadar. 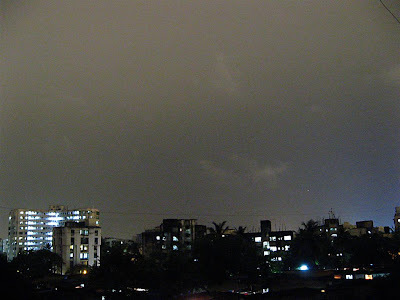 The sky in Mumbai at 2049hrs tonite! We had a rather stormy afternoon/evening but then around 2000hrs the sky cleared and I managed to capture a bit of sky for our skywatchers around the world! 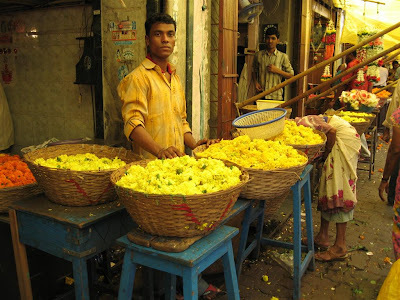 A row of shops, in Dadar old flower market, selling Marigolds. These are sold by weight. The marigold is widely cultivated in India and Thailand, particularly the species T. erecta, T. patula, and T. tenuifolia. Vast quantities of marigolds are used in garlands and decoration for weddings, festivals, and religious events. The common name, "marigold", is derived from "Mary's Gold", and the plant is associated with the Virgin Mary in Christian stories. 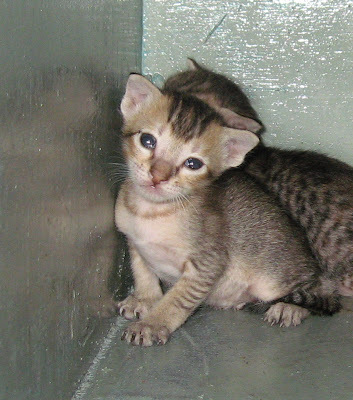 The different species vary in size from 0.05-2.2 m tall. They have pinnate green leaves, and white, golden, orange, yellow, to an almost red floral heads typically (0.1-) to 4-6 cm diameter, generally with both ray florets and disc florets. 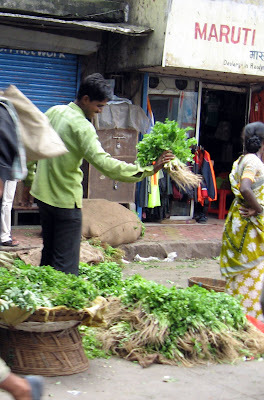 A vendor in Dadar hawking Coriander. Coriander (Coriandrum sativum), also commonly called cilantro, is an annual herb in the family Apiaceae. Coriander is native to southwestern Asia west to north Africa. It is a soft, hairless plant growing to 50 cm [20 in.] tall. The leaves are variable in shape, broadly lobed at the base of the plant, and slender and feathery higher on the flowering stems. All parts of the plant are edible, but the fresh leaves and the dried seeds are the most commonly used in cooking. Coriander is commonly used in Middle Eastern, Mediterranean,Indian, South Asian, Latin American, Chinese, African and Southeast Asian cuisine. The leaves are variously referred to as coriander leaves, cilantro (in the United States, from the Spanish name for the plant), dhania (in the Indian subcontinent, and increasingly in Britain), Chinese parsley or Mexican parsley. The leaves have a very different taste from the seeds, similar to parsley but "juicier" and with citrus-like overtones. Apologies for posting it 08hrs late. Had connectivity problems. 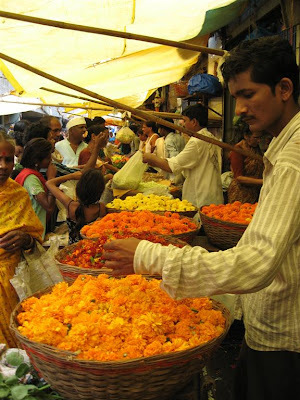 One the railway station side of the flyover in Dadar is the old flower market. Now though it is shifted about 5kms south, there still are the old timers who linger on to sell flowers. The ones that you see in the picture are the hawkers while the licensed sellers ply their trade from regular shops. This is one end of the flyover/bridge that goes over the entrance to the local Dadar railway station. You can imagine the chaotic conditions if the traffic had to go through the crowds seen in the photo posted yesterday! At the end of the road is the Dadar railway station for local trains. About a decade back a flyover was built (on the side of which you can see a hoarding) to ease traffic woes on this road as it is a major arterial route connecting North-South Mumbai. I remember how chaotic it used to be then. Life is easier now for the shoppers, commuters and traffic. We had a respite from the rains that brought out all the hawkers hawking their wares on the road leading to the Dadar railway station. Dadar is a major junction and railway terminus for a lot of interstate/intercity trains. It is humming with activity 24x7 for 365 days of the year. 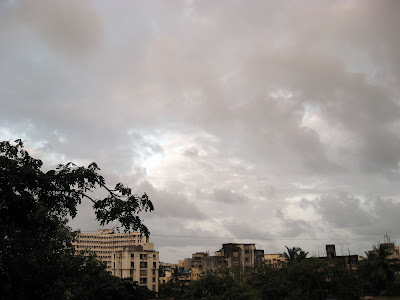 This is how the sky looked in Mumbai at 1655hrs today, with a partial solar eclipse in progress. Metal or metalling has had two distinct usages in road paving. Metalling originally referred to the process of creating a carefully engineered gravel roadway. The route of the roadway first would be dug down several feet. 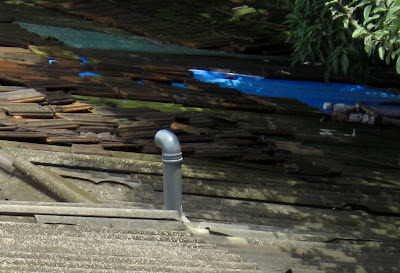 Depending on local conditions, French drains may or may not have been added. Next, large stone was placed and compacted, followed by successive layers of smaller stone, until the road surface was a small stone compacted into a hard, durable surface. Road metal later became the name of stone chippings mixed with tar to form the road surfacing material tarmac. A road of such material is called a "metalled road" in British usage, or less often a macadam road, however the most common name applied to any road surface is "tarmac", regardless of it's actual construction. The word metal is derived from the Latin metallum, which means both "mine" and "quarry", hence the roadbuilding terminology. There are currently 183 blogs participating in this theme day.